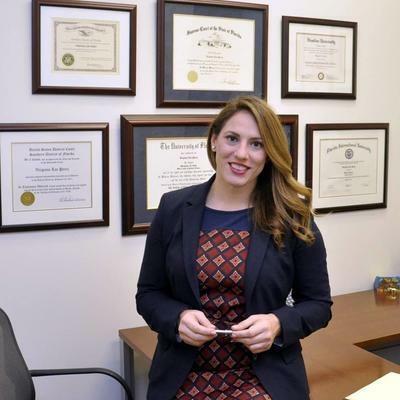 Virginia Lee Perez is an attorney that practices in South Florida. She is a member of the Florida Bar and is also a Florida Supreme Court Qualified Arbitrator and FINRA Dispute Resolution Arbitrator. Ms. Perez earned a Juris Doctor from Florida International University College of Law and received a Certificate in International Commercial Arbitration Law and Practice from Hamline University. Ms. Perez strives in competition, professionally and personally. When Ms. Perez isn't helping clients or otherwise practicing law, she trains and competes in Brazilian jiu jitsu and rugby. "Virginia was my attorney in a lengthy civil suit and always came very prepared with all her facts. Very succinct in her delivery and I was very satisfied with our outcome. She knew my case as if she was me. Great memory. Absolute logical thinker who put me at ease as I was passionate in my case and she helped with logical responses." "I continue to rely on the law office of Virginia Lee Perez for my most important business and personal legal matters. I value the expertise, professionalism and competitive rates that VLP PA provides." •	Counsel and represent clients with property matters including assisting in real estate transactions, litigation, asset protection, and landlord tenant disputes. •	Assist clients with contract drafting and disputes including collections from corporate debtors and other breach of contract disputes.